STOCKHOLM, April 10. /TASS/. Sweden’s Prime Minister Stefan Lofven has said that he plans to continue political dialogue with Russia. 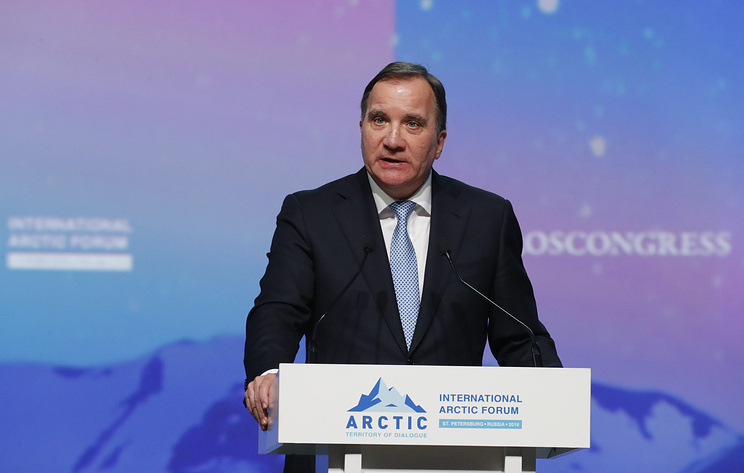 Lofven visited St. Petersburg on Tuesday to take part in the International Arctic Forum “The Arctic: Territory of Dialogue.” The Swedish prime minister also met with Russian President Vladimir Putin. “I appreciate the opportunity to discuss politics at this level, and I intend to continue political talks [with Russia]. It is clear that we need this. We have consensus on some issues and disagreements on others,” Lofven told the Expressen newspaper. The prime minister found his meeting with Putin very valuable. “It was an important meeting, and it was a right thing to do,” Lofven said adding that “we always need to try improving our relations with Russia even further. The issue the sides disagreed on the most was the situation in Ukraine, he noted. “He [Putin] thinks that our understanding of this is incorrect. It was an issue that showed that we have different outlooks on this. I clearly state my opinion on this matter because it is important for Sweden,” the prime minister stressed. Hey Buddy!, I found this information for you: "Sweden wants to continue political dialogue with Russia — prime minister". Here is the website link: https://russophile.org/sweden-wants-to-continue-political-dialogue-with-russia-prime-minister/. Thank you.